Folk songwriter Itasca is set to release her sophomore album Unmoored By The Wind on October 14 via Matt Mondanile's (Real Estate, Ducktails) New Images label. Today she shares album standout "Nature's Gift." Kayla Cohen, a.k.a. Itasca, is a folk guitarist and songwriter from New York State. 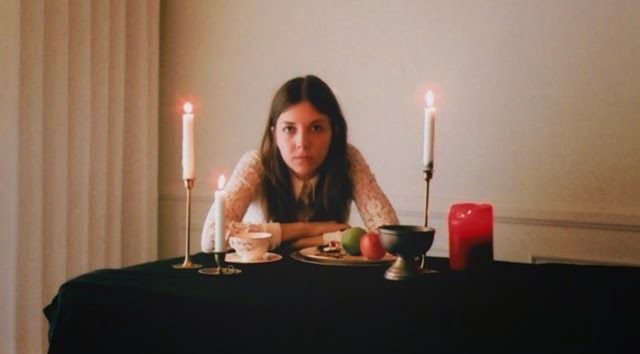 She has released several small press CD-Rs and cassettes over the past five years, and began recording as Itasca after a move to Los Angeles in 2012. She records at home, taking inspiration from the fringes of LA's open space and natural land. On Itasca's latest full-length, Unmoored By The Wind, Kayla Cohen achieves new levels of clarity and expansiveness. Where 2012's Grace Riders on the Road reveled in homemade intimacy, Unmoored By The Wind opens to the world, reaching a timeless, near-baroque yearning; each of these eleven tracks burns with a unique vision. At once soft-spoken and virtuosic, Cohen's fingerpicking mesmerizes, laying gauzy groundwork for vocal work David Keenan rightfully cited as "courtly...dazzling." It's a spacious set of songs, one you can wander into, flowing seamlessly between wistful interludes a la Bob Desper and fully-fledged verses of powerful, often beguiling imagery. "Two male shapes are standing/ Shrouded in white cloth" sings Cohen on "Nature's Gift," with a plaintive candidness that echoes Sibylle Baier. "They're looking at me/ Sort of smiling/ Seems as if I've called them here." Cohen's voice has a windburnt quality reminiscent of Lal Waterson or Collie Ryan, but it's tempered with sweetness, and on songs like "Colt In Hiding" she realizes an angelic luster. More than ever before, though, Cohen's confident singing is laid bare; vocals ride on top of arrangements, taking their rightful place in the forefront. The effect is arresting. Cohen has achieved new levels of clarity, while staying true to the seductive ghostliness that has come to characterize her sound.